Digital UltraViolet and Digital Copy will makes it possible for you to stream the movie Mamma Mia! Here We Go Again HD UV or iTunes Code via MA instantly to your computer and compatible Smartphones, Andriod, iphone, iPod Touch, iPad and tablets devices anytime, anywhere. 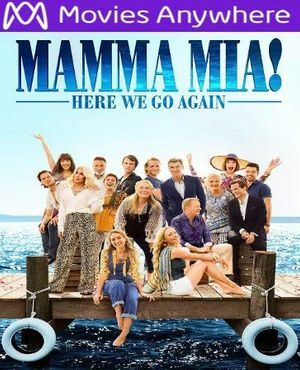 You can also download a Digital UltraViolet Copy or a Digital Copy of the movie Mamma Mia! Here We Go Again HD UV or iTunes Code via MA to your computer and compatible devices. Editorial Reviews Taking place ten years after the original film, Sophie (Amanda Seyfried) is pregnant while running her mother Donna�s (Meryl Streep) villa. Mamma Mia! Here We Go Again, tells the story of how a young Donna (Lily James) came to start up her villa, met each one of Sophie�s dads, and raised Sophie on her own. Sophie is also faced with an unexpected visit from someone she had not invited or expected to see: her grandmother, Ruby Sheridan (Cher).